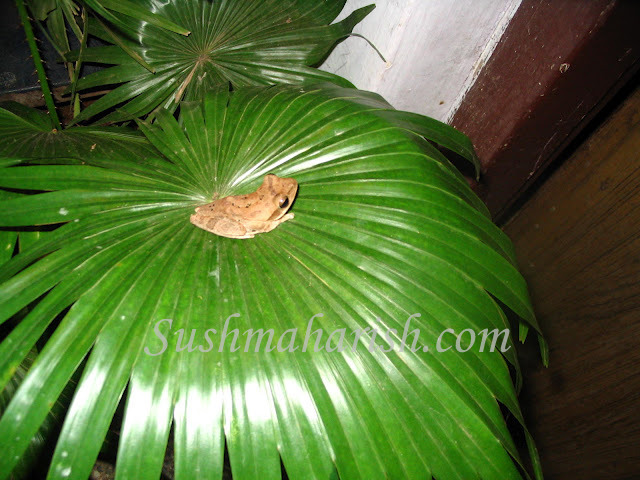 Sushma's Page: Mr.Froggy finds green seat. As I packed and unpacked, shifted and relocated, I got busy with all my other paraphernalia. My love for plants cant cease. I shifted them too. Offloaded by transport they landed in a messy corner. Only to seem as home for this frog. I dedicate this post to the F-Day of round 9 of ABC Wednesday meme. Please click here for details and more shots. Fantastic capture. I t has found a nice place. it actually travelled with the luggage? From? to? Deepak- Yes, had this not been a hurried photography we should have had a better view too instead of enlarging. And this frog seemed to travel perhaps from mangalore by truck to Manipal! Wonder when it managed to creep in, but from the time the plant was offloaded in manipal it stuck to the plant for a while till we shooed it away! Rajesh- Yes.glad u liked it. Hey nice froggy! You should have taken him with you! easy to maintain and constant talker, fits in your handbag!! Nice photos below, a contest on indibloger on for photography, go check it out, you have a good eye! Ash- I would have to apply the froggys passport in that case.!! What a delightful little guy he is! And what a terrific capture, Sushma! I love it! I'll look forward to returning here again!! Thank you for your visit to my blog and your comment! Always appreciated!! Have a wonderful day! vote for this if you like it. What an adorable picture ! @Gattina and rainboy- glad u liked it. Awesome capture! That's a rare green seat! Inviting you to join Orange Tuesdays..still open till tomorrow..
ooh, it is not that i hate them but i just don't like them . he he he, thanks for sharing. wow, didn't see the frog first off! nice shot. The little guy looks like he has found the perfect comfy spot.